In less than one month I head to Bolivia to explore, shop and discover –alone. If you know me at all, you already know that I have an affinity for solo travel. I don’t want to say I always prefer it because I enjoy visiting places with people I love (like you, Mom! ), but I do possess the spirit that makes traveling alone an important part of my overall discovery of new lands. When I am by myself, I see more and feel more. My senses are heightened. Every part of me soaks in the newness in a way I just don’t experience when with companions. I feel the rhythm of life more completely in the new destination and commune more with the locals. To me, solo travel is exhilarating. Though, it isn’t perfect. Yes, I can get lonely. Yes, I can be harassed. Yes, my budget doesn’t go as far. Yes, I don’t get to participate in tours that require a minimum of two participants. Yes, I get tired of the voice in my head :). BUT, the sheer sense of freedom and adventure always outweighs these moments of temporary discomfort. In anticipation of my upcoming trip, I thought I would highlight some of the practices that always make my solo travel so rewarding. Prior to any trip, I run my Internet browser ragged! I search for all the secret spots, best-hidden restaurants, and highest-rated tours. I post on social and travel websites about my trip with questions I may have and look to natives for advice on what they recommend I see or do. I create spreadsheets with my trip itinerary– where I will stay, how I will transport from Point A to B, what tours I have signed up for, and all the contact information I will need once I touchdown in the new territory. Of course, no trip is ever long enough (even my near two years in Paris felt too short to me), so putting together a researched plan prior to arrival has allowed me to maximize limited time, as well as give me a daily purpose. I should note, however, that my itineraries always include lazy afternoons in cafes or getting lost in the streets of a new city because it is in these moments I usually find the most pleasure. Safety is obviously critical, and staying alert is paramount. I know as a solo woman traveler I am more vulnerable when I enter a new culture or country, so I take the extra effort to familiarize myself with my surroundings. I never rush, and constantly scan the people, signs and events around me. On metros, in crowds, and walking the streets, I keep my senses alive and personal effects close. By practicing these precautions, I have traveled alone to Mali, Senegal, Morocco and India with no incidents, always feeling safe. This sense of security was not, however, always the case for me. 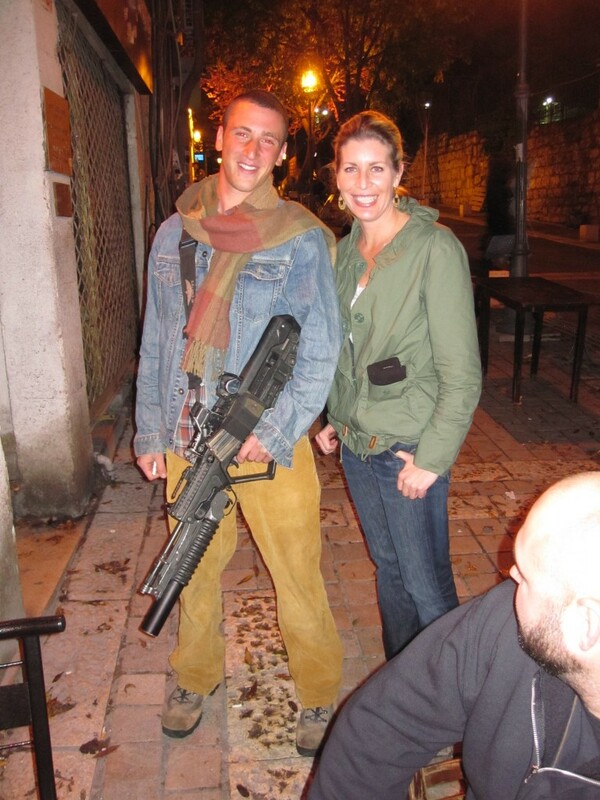 As a young and more naive traveler (15 years ago) I had experiences in Mexico, Cuba and Costa Rica where I was robbed, sexually assaulted and physically attacked. Although I came out of each unscathed (albeit a bit frazzled), these incidents conditioned me to the importance of being aware to all that is around me all the time. In some lesser developed parts of our world, I have also adopted the practice of hiring drivers or guides as I navigate cities where I may stand out more than most (for examples, Africa and India). Although it does dip into the travel budget, I appreciate the greater sense of security and having someone to look out for me or help deter unwanted attention. This ultimately enriches the overall enjoyment of the journey. It is true; I love big, fancy hotels and all the amenities they include. But when I “fly solo,” the smaller the hotel, the better. I look for quaint bed-and-breakfasts or boutique hotels that are centrally located and run by local families. I read all the reviews on booking.com, TripAdvisor, and/or trusted guide books to select a “home away from home” with friendly, helpful staff who strive to make their guests’ stay more than just a place they rest their head. In India, this practice proved particularly beneficial as I was treated like a daughter in most B&Bs. The hospitality lapsed into invitations to dinner with the owner and his family, a courtesy 3am pick-up at the Jaipur bus station, and gifts to bring back home. Smaller hotels also usually have other single travelers who become tour companions for a day or two and supply great conversation over a glass of wine while swapping travel tales. 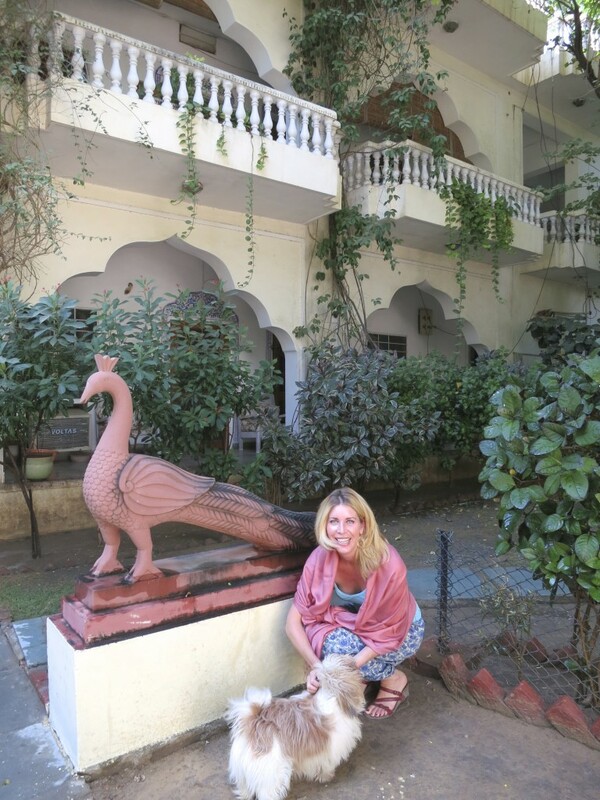 Posing with the family dog at a B&B I stayed at in Jaipur, India. 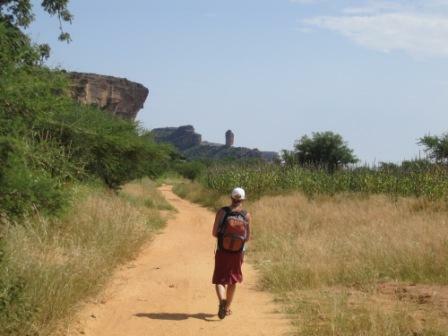 The biggest pitfall of solo travel? No built in dinner date! Undoubtedly I have found delightful, interesting meal companions throughout my journeys (sometimes even at the table next to me), but it isn’t guaranteed. For these meals, I bring something to occupy myself between courses. My Kindle is always snugly packed in my over-the-body travel pack, as well as a small notebook where I can capture my thoughts or observations. 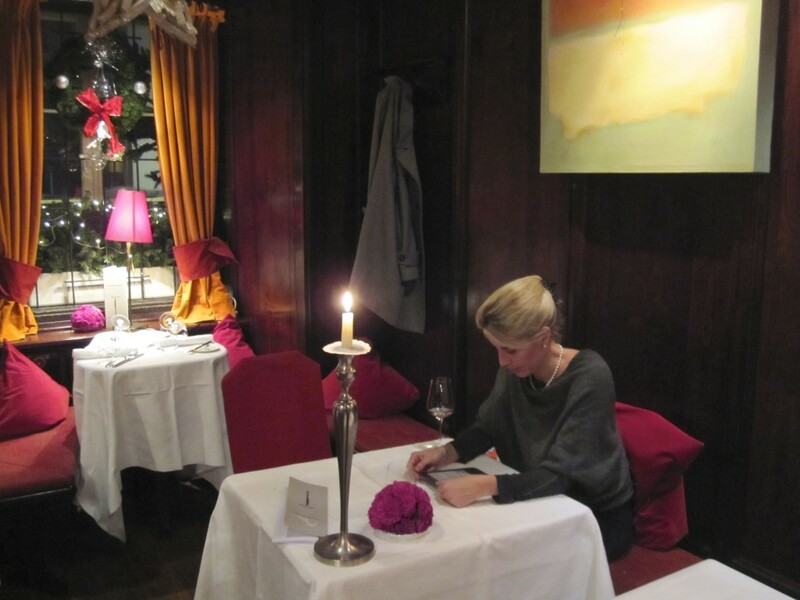 If I am in the need of social interaction, I look to dine at a restaurant or cafe that has counter service so I can engage other diners or the staff. Meal time alway involves a bit of strategy when traveling on my own. Do I talk to everyone? No. Do I accept every invitation from all who extend them (particularly men)? No. BUT one of the key reasons I travel alone is the opportunity to meet people and experience elements of a culture or country that I might have missed out on otherwise. I engage most (not all!) that reach out and also do my best to reach out to others. I use tools like Couchsurfing, Meet-up, ASW and other social media sites to find local activities with a local crowd and flavor. I always contact “friends of a friend” who were recommended to me. Many of these encounters have resulted in long-term friendships and some of my most memorable and unique moments during my travels. I don’t leave home without three things: my passport, my international power adapter, and my iPhone (actually two of them–my US iPhone and my international, unblocked iPhone). Having a phone I can use to text and make calls in my destination is uber important to me. As a solo woman traveler I never want to feel or be helpless, and having my international phone with a local SIM card (research where you can get one in your destination country prior to departure) or an international calling plan with my US phone is a necessity. Period. I also ensure all critical contact numbers are in my phone before I set out onto the streets, and that my family has all important numbers before my departure (including hotel contact information). 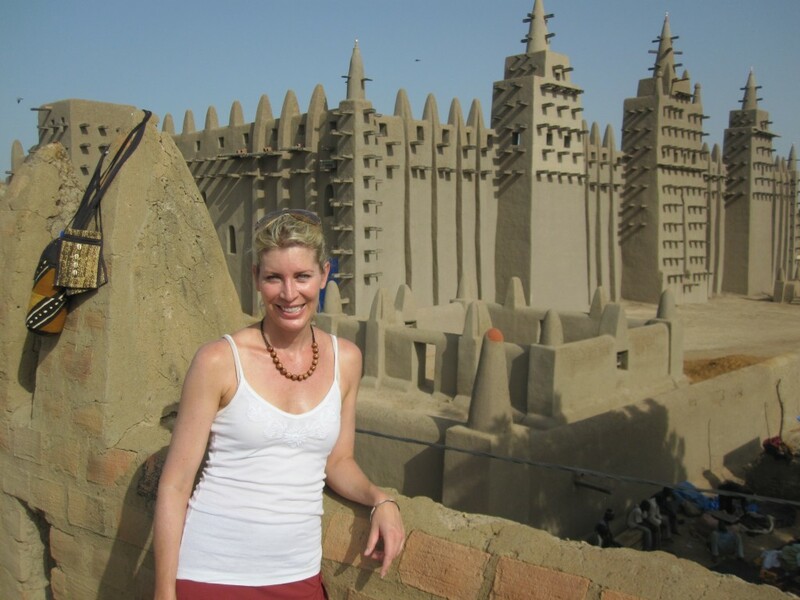 A new local friend, Leah, who I met in Segou, Mali. This is us at her friend’s wedding she invited me to! I do like to plan my trips to the fullest, but never am I so steadfast on something that I don’t allow the unexpected or unplanned to deviate my itinerary into something greater than I expected. Like you, I travel to experience the unknown, so being open to it has sweetened many experiences while away from home. Make sure you do the same. 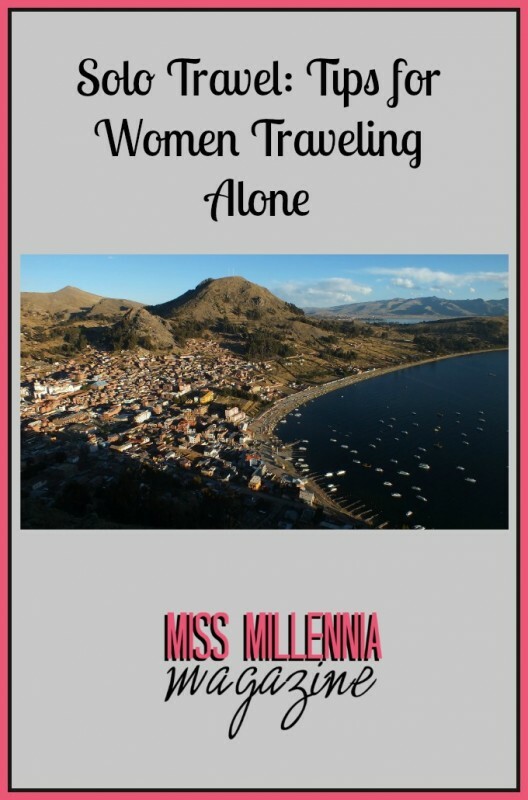 Follow my Bolivian adventures on my personal travel blog, One Girl’s Adventures, and on Facebook or Instagram.